Shirts With Random Triangles: Oklahoma adds Texas high school running back Rodney Anderson to its 2015 recruiting class. Oklahoma adds Texas high school running back Rodney Anderson to its 2015 recruiting class. Rodney Anderson. Photo via Crimson and Cream Machine. 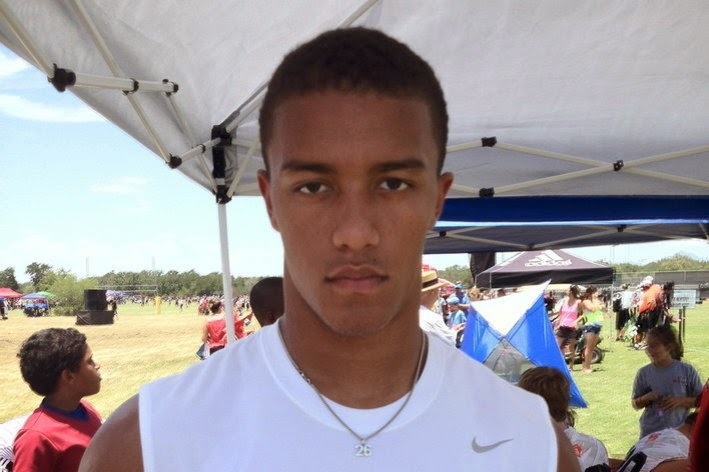 Oklahoma has the sixth member of its 2015 recruiting class with a four-star all-purpose back prospect from Katy, Tx. High School rising senior running back Rodney Anderson committed to the Sooners class of 2015 on Sunday. Anderson is Rivals.com-graded four-star all-purpose back. He is ranked by the recruiting site as the third-best all-purpose back in the U.S, which should tell you how big his commitment is for the Sooners. Rivals ranks Anderson as the eighth-best prospect in Texas, and the 80th best prospect overall in the U.S.
Anderson attends Katy High School in Katy, Tx. He stands 6'0, and weighs 200 lbs.